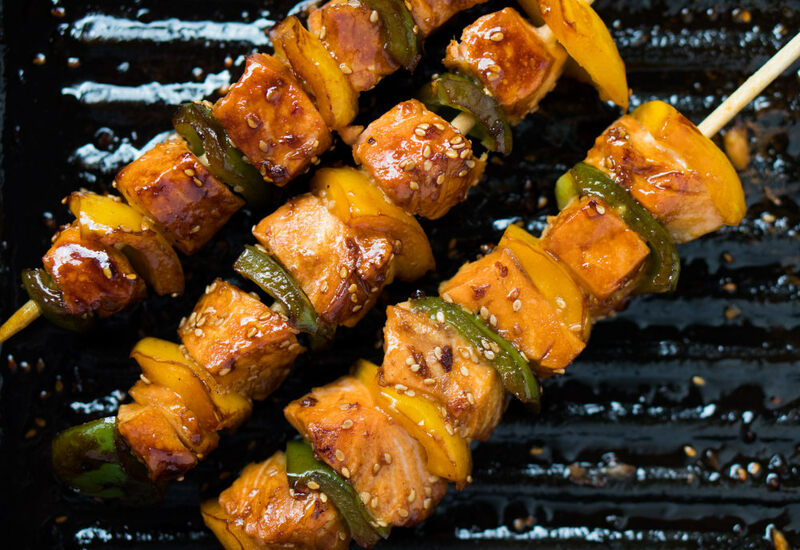 These salmon teriyaki skewers offer a burst of exciting flavors. The marinade in this recipe works well with all types of fish, but is scrumptious with salmon and bell peppers. Garlic and ginger have many health benefits, including possibly reducing inflammation and helping digestion. You can use chicken or pork instead of the salmon. Serve with white rice and steamed vegetables for a light and healthy meal. Try using all agave nectar instead of brown sugar and agave nectar for less processed sugar. You can use olive oil instead of the coconut oil for cooking. Per Serving: 717 calories; 49g fat; 15.9g carbohydrates; 52g protein; 143mg cholesterol; 1021mg sodium. You do not need an outdoor grill to enjoy these. I mean, it will taste slightly a bit better with the grill flavor, but these worked just fine on my cast iron grill pan. Great for your next game day feast! I've always loved teriyaki salmon but typically used a store bought marinade. After trying both, I definitely prefer the homemade version! It tastes so good, very authentic. These skewers were perfect for my house party, everyone loved them! These teriyaki salmon skewers are perfect on any grill. Even the kids loved them! The delicious, sweet, tangy teriyaki flavors were really infused in this dish after letting them marinate overnight. I've got to make it more often.